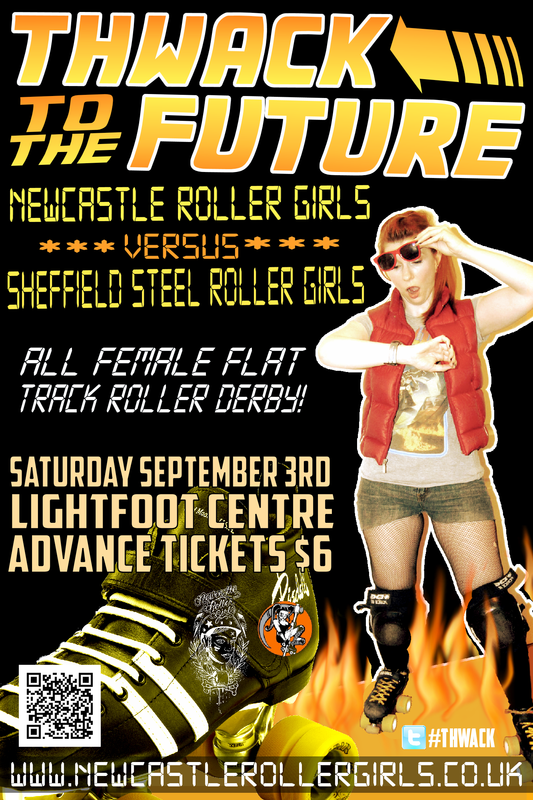 Newcastle Roller Girls have a radical bout in store for you guys with their latest event on home turf, “Thwack to the Future”. Set your flux capacitor to Saturday, September 3, up your speed to 88mph, and let us travel through time to a fantastic double header of roller derby skills. If my calculations are correct, you’ll see the warm-up bout at 12.30pm, as the Newcastle Roller Girls’ Whippin Hinnies take on the Sheffield Steel Rollergirls B Team. Then strap yourself in for a bumpy ride as at 2.30pm the Newcastle Roller Girls’ Canny Belters hit the track to take on the might of the Sheffield Steel Rollergirls. If you’re new to roller derby then chill, and let us explain it to you. 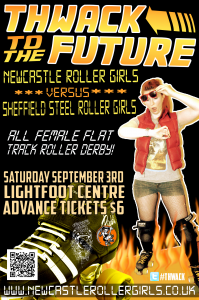 We’re a top bunch of girls who put on quad skates, leg warmers and hot pants, and then bash into each other. It’s a game of tactics, skill and speed, and is wholesome family fun, with half-time entertainment that will take you back to 1955. Oh, and yeah, come and celebrate post-bout with us at 5pm at Mr Lynch, Jesmond, where we like to party like its 1985… and 1955. Make sure you don’t miss out buy your ticket below now! (Under 12s have the honour of free entry, however, under 16s must be accompanied by an adult). Tickets now only available on the door. We will have details on the door of everyone who has bought a ticket, but just to be on the safe side, you can print your ticket off or show us it on your phone if your worried we might not have your details.